Everything!!! 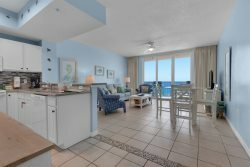 the ease of check in, the cleanliness of the property, the beautiful family oriented beaches, and the pier! I really liked the directions, list of "what to bring", nearby stores and restaurants along with emails as the reservation time approached. It was reassuring that you were expecting our arrival. Wonderful view of the pier, ocean and surf. The condo was beautifully decorated and very comfortable. The condo was excellent and the perfect size for our needs!